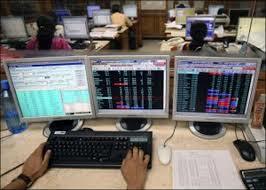 The 30-share Sensex ended down 69 points at 28,192 and the 50-share Nifty closed 20 points lower at 8,551. Indian markets fell for the fourth straight session today with benchmark Sensex dropping 69.06 points to nine-week low of 28,192.02 on weak European cues and caution ahead of expiry of monthly derivative contracts. The NSE Nifty index also edged down by 20 points to a fresh six-week low of 8,550.90. Selling was seen mainly in select heavyweights in IT, telecom, banking and consumer durable counters. Small-cap and mid-cap counters also ended in the red. Overall, about 920 stocks gained while over 1900 fell on the BSE. The benchmark S&P BSE 30-share gauge resumed better and improved further to a high of 28,385.14 on firm Asian trends on the back of rally on Wall Street last weekend. However, selling after mid-session on weak European cues ahead of a key meeting between heads of Greece and Germany pulled it down. It settle for the day at 28,192.02, a net fall of 69.06 points or 0.24 per cent. This is its weakest close since 28,121.89 on January 16. Shares of Jindal Steel and Power Ltd (JSPL) — a constituent of 50-share Nifty — ended over 6 per cent down after crashing as much as 15 per cent in morning trade today after the government rejected bids made by the company during the auction of coal blocks held recently. Bucking the overall weak trend in largecap bluechips, Hindalco and NTPC gained on good demand. IT stocks dropped mainly due to rise in the rupee value against the US dollar, said brokers. On the global front, Asian stocks closed higher. Key indices from China, Hong Kong, Japan and Taiwan rose while those from Singapore and South Korea ended slightly lower. In Europe, France’s CAC index was down by 0.73 per cent and Germany’s DAX was trading 1.10 per cent lower while the UK’s FTSE was up by 0.70 per cent.